How to open a new folder tab? How to open a new file container tab? How to close a folder tab? Note: You can’t close the last tab within the panel, if the option “Always keep one tab open” is checked. I have closed the folder tab by mistake, how to re-open it? You can re-open the folder tabs you closed recently. Click the right mouse button over the tab, go to “Recently closed tabs”, and click the tab you want to re-open. You can use the keyboard shortcut (Shift+Ctrl+T) to quickly re-open the last closed tab. Note: You can lock the tabs to prevent accidental closing. 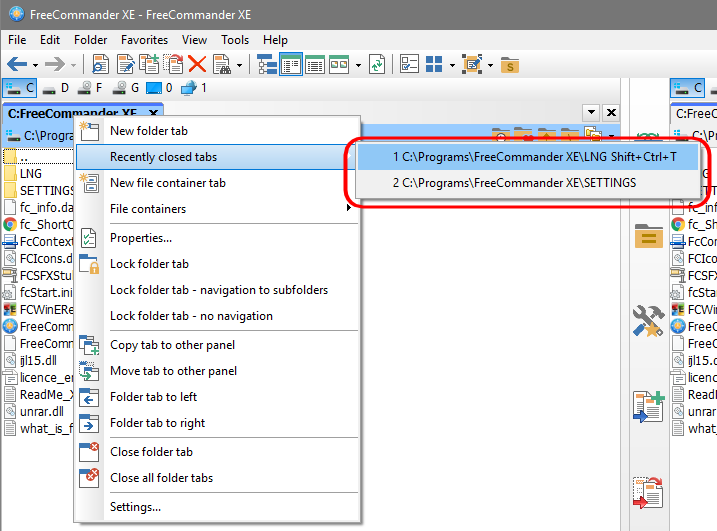 When I exit FreeCommander, all folder tabs (except one) are closed, how to save the folder tabs? 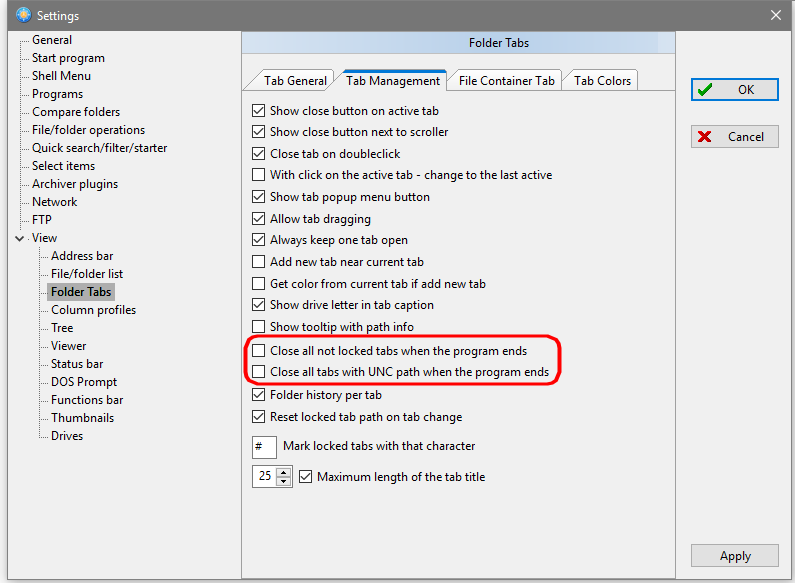 Open the Settings (F12), go to View → Folder Tabs → Tab Management and uncheck the options “Close all not locked tabs when the program ends” and “Close all tabs with UNC path when the program ends”. Note: Unchecking the option “Close all tabs with UNC path when the program ends” may slow down the FreeCommander startup. Alternatively you can lock the tabs you want to save for the next session. How to lock a folder tab? Click the right mouse button over the tab you want to lock and click the option “Lock folder tab”. Can I limit the width of the tab? 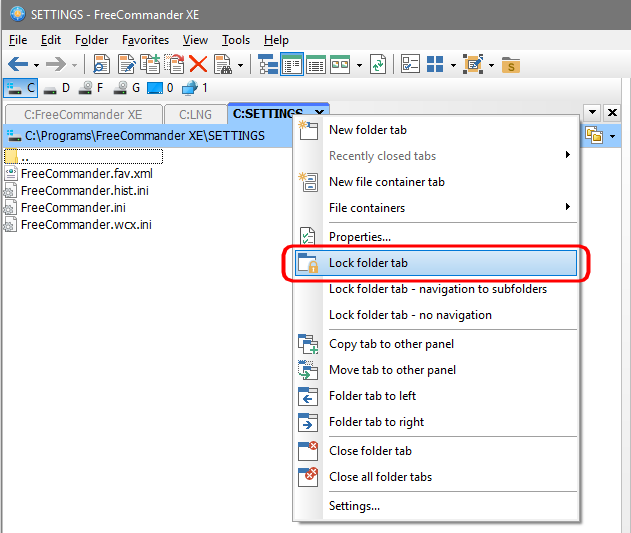 Open the Settings (F12), go to View → Folder Tabs → Tab Management and change the value next to the option “Maximum length of the tab title”. I am not using the tabs, can I hide the tab area? 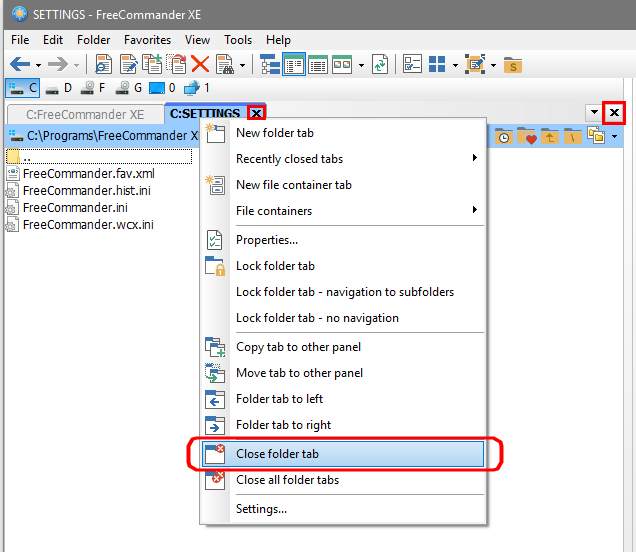 Open the Settings (F12), go to View → Folder Tabs → Tab Management and uncheck the option “Always keep one tab open”. Note: You need to close any opened tabs first, then it’s possible to hide the last opened tab. Can I change the order of the tabs? Yes, you can change the tabs order, just drag&drop the tab to another position. Can I copy/move the tab from one side to another? Alternatively, you can drag&drop the tab to another panel, to copy the tab. I would like to lock the folder tab and give him the specific name. Is it possible? Then right click the tab again, select the option “Properties…”, change the name within the “Tab name:” field and click the “OK” button. Can I change the color for some important tabs? 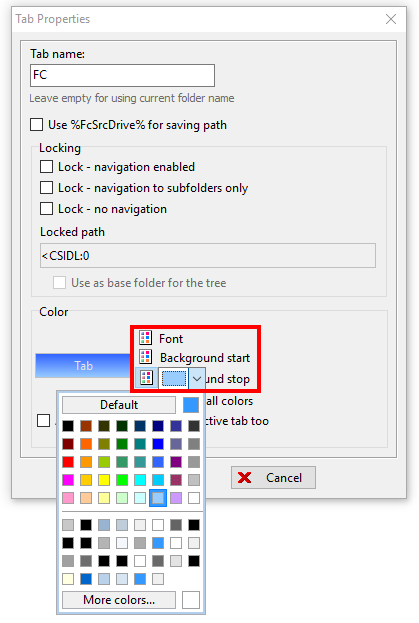 Yes you can, right click the tab, select the option “Properties…”, then you can change the colors for “Font”, “Background start” and “Background stop”, by clicking the icons next to these options within the “Color” area. If you want to use these colors also for the active tab, click the checkbox for option “Always use the colors – for active tab too”. I have navigate to other path in the locked tab. How can I quickly change to locked path? Easily double click the tab title, or click the right mouse button over the tab title and select “Go to locked path” option. How can I close all tabs at once? Click the right mouse button over any tab and click the option “Close all folder tabs”. Alternatively, you can use the keyboard shortcut (Shift+Ctrl+W). Locked tabs can’t be closed this way. If the option “Always keep one tab open” is checked, one tab always stays. I would like to have the tabs at the bottom of the panel. Is it possible? Yes, it is, go to menu → Tools → Settings → View → Folder Tabs → Tab General, and change the option “Tab position” to “Bottom”. I can not differ the tabs with the name only. Can I see the hint to the tab with the full path? Open the Settings (F12), go to View → Folder Tabs → Tab Management and check the option “Show tooltip with path info”.